Today’s TED talk is about happiness. It’s with Nancy Etcoff, an evolutionary psychologist. It’s 20 minutes. She has some interesting points, e.g. that a successful marriage has a 5:1 rate. Of what, you might ask. For every one harsh and unpleasant thing one spouse says to the other, five niceties are needed to make up for it. So in a successful marriage then, we say five nice things to our spouse for each not-so-nice. Good thing to remember! She mentions words that describe different kinds of happiness and gives us something to think about. Namely that some languages have happiness-words that other languages totally lack! And she muses over the fact that no language she knows of has a word to describe one’s happiness for another person’s happiness. First say to yourself what you would be. Then do what you have to do. Today is Ada Lovelace day. Ada what-day? I hear you say. Well, Ada Lovelace was a pioneer in the technology field, where not many women have been pioneering. Click her name and read all about it. And here you can read how her legacy has been meaningful to her descendants for generations. And here about the idea behind Ada Lovelace day. Today’s Guardian has an article as well. That it’s Ada Lovelace day means that all women who are interested in tech-stuff and also other women who take an interest in feminism celebrate a brave woman who came before us and had a lot less opportunities than we have. I’ve signed a pledge to write a blogpost about a living woman who’s made her mark in the tech community. At first I had no idea who to write about, but then I heard about Manuela Veloso. I listen to podcasts of a Danish tech programme called Harddisken and they had met her and interviewed her. I took an instant liking to this little busy, busy middle-aged Latin woman, who has made a career for herself in robotics. It’s not rocket science, but it’s d… close! My long-term research goal is the effective construction of autonomous agents where cognition, perception, and action are combined to address planning, execution, and learning tasks. My vision is that multiple intelligent robots with different sets of complementary capabilities will provide a seamless synergy of intelligence. Concretely, my research focuses on the continuous integration of reactive, deliberative planning, and control learning for teams of multiple agents acting in adversarial, dynamic, and uncertain environments. Of particular interest to me is learning, adversarial modeling, reuse, and abstraction in multiagent problems. 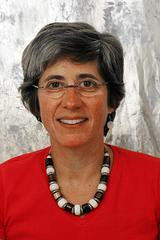 Manuela Veloso. Picture from Carnegie-Mellon homepage. She’s Portuguese, but works as a professor at Carnegie-Mellon University in Pittsburg. Details about her personal life – like her date of birth – are scarce, but from her picture and career I think it’s safe to say that she’s around 50. Why she left Portugal is anybody’s guess, but it was probably a career-move, judging from her CV. Because her main interest is the so-called “flocking” (=computers copying the behaviour of birds or fish when travelling together in big flocks or shoals), she has taken a particular interest in robot soccer games. Read about that here. If you just for a moment start thinking about what it entails to embed flocking behaviour into robots, so that they might behave like a flock of starlings is completely mind boggling! So there, that was my two pence for women in tech. Oh, and I think that if you’ve made it this far, you could also click here to aid the Breast Cancer Foundation. I’ve now been twittering for a couple of weeks and am beginning to understand the workings of Twitter. For me it’s a place to harvest (more) interesting info than I’d otherwise find. Sometimes a bit on the much side I’m afraid. Below you’ll find a scattering of info that’s been twittered from my followees throughout the weekend. Particularly the tech-ones have been inanely active, since they are all gathered at SXSW. A review of the app Dropbox, which I’m a very contended user of. For instance, it’s a great way of sharing documents between me and my writing partner at uni (he’s in DK). And thanks to him for recommending Dropbox. Blogger apps for the Iphone. Sounds veeeery interesting, haven’t looked at all of them yet. A Youtube add-on that makes it safe for little children. Quite good if you like your kids to browse away but preferably not to stumble over some of the more horrid videos that are in ample supply on Youtube. I think this will work up till the age of 8-9. After that they’ll have learnt to circumvent it and it’ll be up to you to teach them how to navigate not only Youtube, but all of the web. We learn more from the unexpected than from the expected. Our brains respond just like the traders on the stock exchange floor. That’s bloody disappointing! From Science Daily. In her opinion, the best way to keep one’s cerebral functions is to do intellectual activities, eat well, control vascular factors, particularly in the case of diabetes and hypertension, and remain physically active. Brain activity reveals memories. Science Daily. This article (Science Daily again) reveals why I’ve never been able to make serious money. I was not particularly popular as a child. Or what? My mother is dead, unfortunately, so I can’t share this information with her. I would’ve liked to, because I think she might secretly have blamed herself for my cleft palate/lip. But it’s in the genes! Luckily then, I haven’t passed it on to my sons. Here’s another story to do with genes. It supports every smoker’s favourite story about the Grandmother who Smoked 20 Cigarettes a Day and Lives Happily to be a 100 Years Old. I don’t usually quote the Telegraph, since it’s rarely worth quoting, but that’s the point really. To equal a school, which actually does something actively to improve the pupils’ health with Gestapo is just so out of this world!!!! My son tells me that, although his school has strict policies about sweets and crisps NOT belonging in the lunch pack, lots of children still have it every day! It’s just sad, sad, sad that parents understand so little about nutrition that they give their kids a packet of crisps and a white cardboard sandwich with square ham every day! It certainly supports the study about how IQ and education are directly linked to life expectancy, which I wrote about previously. Why women opt out of certain careers. The Health and Safety Executive has a myth-buster page, which is a comforting read. Clearly, what we’re seeing at schools and other places are over-zealous interpretations of the health and safety rules. So if we just stuck to the rules themselves, we’d be fine. Here’s a great example. About coffee. Why the crap coffee in canteens and at railway kiosks gives a much higher boost of caffeine-induced energy than the luxury coffee we brew at home. I once bought a pair of shoes that didn’t fit. I blame my brain. I was a victim of a dopamine rush. That pesky neurotransmitter had been primed by previous shopping highs to flood my brain with the desire to take another hit. High as a kite, I made a stupid decision. I knew the shoes didn’t fit as I was buying them and, a few days later, too ashamed to go back to the shop, I chucked them away. I learnt nothing from this. I still chuck away almost new stuff. This is because dopamine is stronger than my will. It likes the shopping high and there’s no way it’s going to let my pathetic ideas of common sense, rationality or correct shoe size get in the way. This doesn’t happen to me, I hear you say (I heard myself say that). I make rational decisions while shopping, I never buy things I don’t need (!!!). The message here is: decisions are never what we think they are. Western civilisation has laboured under a delusion that runs from Plato to Lieutenant Commander Data, the robot in Star Trek: The Next Generation. The delusion is that suppressing our emotions is the best way to make decisions. Data has no emotions and makes perfect decisions. When they give him an “emotion chip”, he breaks down, unable to decide anything. Well, first, be careful what you say to your children. An experiment by the psychologist Carol Dweck in New York City schools involved giving children tests in which there was only one variable. After the test some were told they were clever; others were congratulated for working hard. Those told they were clever slumped into a kind of intellectual torpor; those told they had worked hard bounded ahead. In one group the scores of those called clever dropped by 20% and the scores of those called hard-working rose by 30%. There’s a big point here about how they chose: they self-corrected. While the clever group thought all they had to do was turn up, the hard workers considered their own mistakes. A while back I cited an article called Is Google Making Us Stupid here and also posted it on Facebook. It elicited quite a few reactions – as it had for me, the article touched a nerve with some of my FB friends. At the moment when I’m not just normally scatterbrained, but also preoccupied with things in the personal sphere, I find it even harder to focus on one thing at a time. What I should do with all the things I remember that I have to do while doing something else, is of course to write them down, so I can do them later. But all too often I just rush away and do them NOW. Or I do them only half way, because in the middle of doing it i remember something else, which seems even more important. And so goes the day. Things most certainly get done, no doubt about it. But they probably would get done anyway, as long as I write it down! What I don’t get done is study. I need to read this book, some chapters in other books and some articles. The book is not on the world’s most interesting subject, but it’s actually quite well written and I don’t have to read every chapter through and through. So why is it I don’t get around to it? So this is what I’m setting out to do tomorrow: I’ll set one hour aside to reading the book. Though I usually always take notes directly on my laptop (in super-cool little app called Tomboy by the way), I’ll leave the computer closed and leave markers on pages with pencilled notes for later digitization. And I’ll set another hour aside to do real focused research for my paper, where I’ll do as (26-year old) Peter Clemens suggests and say NO to all ideas of veering away from the research path. At least for that ONE hour. Will let you know to what degree I succeed! On 14 December 2005, the scientific journal Nature reported that, within 42 randomly selected general science articles, there were 162 mistakes in Wikipedia versus 123 in Britannica. In its detailed 20-page rebuttal, Encyclopædia Britannica, Inc. characterized Nature’s study as flawed and misleading and called for a “prompt” retraction. It noted that two of the articles in the study were taken from a Britannica year book, and not the encyclopedia; another two were from Compton’s Encyclopedia (called the Britannica Student Encyclopedia on the company’s web site). The rebuttal went on to mention that some of the articles presented to reviewers were combinations of several articles, and that other articles were merely excerpts but were penalized for factual omissions. The company also noted that several facts classified as errors by Nature were minor spelling variations, and that several of its alleged errors were matters of interpretation. Nature defended its story and declined to retract, stating that, as it was comparing Wikipedia with the web version of Britannica, it used whatever relevant material was available on Britannica’s website. Below find my essay – only edited slightly for use here (no footnotes etc.). If you can’t be bothered to read the whole thing – about a 1000 words – then scroll down to the bottom. There’s my tips for what to think about before you delve into a Wikipedia article. The battle between Encyclopedia Britannica (hereafter EB) and Nature was intriguing – not least because it, in my view, is somewhat beside the point. Nature’s intentions were honourable, I believe, in letting their very informed readers know if it can be considered worthwhile – not safe – to use Wikipedia for anything. And they seemed to be rather baffled themselves at the result, that yes, it is worthwhile, also for the informed user, to consult Wikipedia. In my view the article did not try to put EB down. One of the more interesting facts the investigation revealed was that the learned test persons were more sceptical towards the random articles than towards the articles within their fields of expertise. For reasons that I can’t quite understand, many teachers at all levels of the schooling system tell their pupils to NEVER use Wikipedia. Many times I’ve heard well educated and academically trained people say that they never use Wikipedia, because it’s completely untrustworthy. But upon inspection, they have never used it, so how is it that they know? Probably this is why the test persons were so sceptical towards the articles about subjects outside their intellectual comfort zone. It is also interesting to notice the aggression and fervour with which EB responded to the article. A lot of their response may be correct in a narrow sense, but entirely beside the point, because the Wikipedia articles had had the exact same treatment. And the Nature article is actually quite critical about some things in Wikipedia – like the occasional rather poorly constructed articles and poor readability. This fervour may be related to the sad fact that academia frowns upon academics who choose to put their skills to use for the general public. Nature surveyed 1000 scientists, of which only 10% had ever helped updating Wikipedia. It probably doesn’t improve your academic career to invest time enlightening the public on your speciality. And then there are all the things you can get from Wikipedia, which EB doesn’t give you. There are articles about every little town or village in the Western World, every politician, every pop group, every artist, every historical person, every technical term or gadget known to man – almost. And then there’s the freshness – the articles updated at the speed of light when events develop. Apart from the way they are created, these two factors are what really separates Wikipedia from EB. And why to some extent comparing them is a bit like comparing apples and pears. And access to EB is on subscription basis. In Denmark and here in the UK you can gain free access to EB via your local library. But unfortunately, most people don’t know this – or just can’t be bothered. In EB you cannot see when an article has been created or updated – or at least I can’t find it. And there are very few outside links and no references. When I was a child we had two encyclopedias in the house: Lademanns and Gyldendals. I quickly discovered that Lademanns was best for looking up things to do with nature, science and geography because of the many, good colour photographs and illustrations. Whereas Gyldendal was best on history and literature, because the entries were better and longer. But, and this is the point, it never occurred to me to doubt the authenticity of any of the articles. And I wasn’t taught that at school either. I didn’t hear about source criticism (kildekritik) before high school (gymnasiet), where I had a history teacher (an elderly gentleman) who made it an issue. It was the first time I had ever heard of anyone questioning a source. Every time he gave us something to read, he asked us to consider who had written it, why he had written it and who we thought were the intended audience. This simple wisdom has stayed with me always and I try to remember to apply it to all things I read or hear. The thing about Wikipedia, which could maybe teach many more Internet users source criticism, is exactly the knowledge of how it is written and (not) edited. One must always consider the fact that the article one’s looking at might just have been tampered with by some idiot or a person with malicious intent. Or that it’s written by somebody who has an overblown perception of her own knowledge. This is not a thought that automatically comes to mind when looking up something in EB or another “trusted source”. So I believe that the way Wikipedia is constructed actually encourages its users to be source critical. And that scepticism could even follow the user when she ventures outside Wikipedia and looks at other sources. Quite often Wikipedia is an excellent starting point for research on a subject. Usually it becomes clear very quickly what kind of person or persons are responsible for a Wikipedia article. Some of them are clearly written by scholars or by extremely knowledgeable amateurs and their sources are often gold, when the goal is to move on to primary sources. Other articles are not so well written or edited and one instantly gets wary. That very often reflects on the sources, which will be few and erratic. And I believe this wariness and alertness to be very healthy for the users. What kind of person wrote this? Syntax, writing style, approach to subject. Is the faulty English because the writer doesn’t have English as her mother tongue or is it a warning sign? Why did the person write this? Out of pride, to boast, for political/religious reasons or because the person honestly feels it is her duty to share her knowledge? Does the article have the feel of having been worked over many times? If so, I check the history and debate pages. What are the sources like? Are there many? Are they online, off line or a mix? How many of them are readily accessible (not necessarily online, but from a library)? How sensitive is the subject? Can I maybe believe some parts of the article, but not other parts? This may be the case for quite a few historical articles, where basic facts are agreed on by everybody, but where historians disagree on the interpretation of certain incidents or documents. This is also the case for articles on pharmaceutical compounds. Am I looking at a subject where recent events have led the article to be expanded or changed? The article about Sarah Palin is an obvious example. One can go back to the version of the article a couple of weeks before she was chosen as running mate for McCain and get an impression from that.